Today only, get 50% off this trendy Cents of Style Leopard Cardigan plus FREE shipping with promo code: STEAL50. That’s just $24.99 shipped (before taxes). This Style Steal deal ends tomorrow, 3/19, so head on over to the site to snag one before it’s back to its original price of $49.99! The lightweight cardigan is perfect for spring as you start to put away those big coats – finally! It comes in sizes Small through X-Large (0-16) and in two colors: taupe and ivory. Compare the two colors in the styling photo below. It’s incredibly versatile and can be styled with jeans and a t-shirt for a casual look, or over a pencil skirt and blouse for a more dressed up look. I would probably wear it with my go-to: comfortable leggings and a tank top. 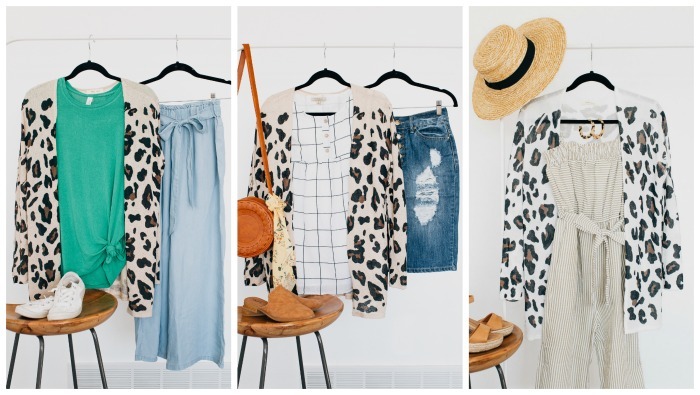 Cents of Style is an online fashion boutique founded by then-stay-at-home mom Courtney Brown. The company’s purpose is to empower women to lead bold and full lives by making the latest in clothing, shoes and accessories accessible and affordable to all women. Cents of Style operates by the following values: HUSTLE, CLARITY, RADIATE, OWN IT, TRIBE, and CREATE. They believe that when you look good, you feel good and then you can, in turn, pass the good to those around you. Isn’t that a beautiful concept? What’s even cooler is that the company is made up almost entirely of women. Who run the world?